When Geronimo and Freddy started rendering the internal walls of my room, we were very excited. 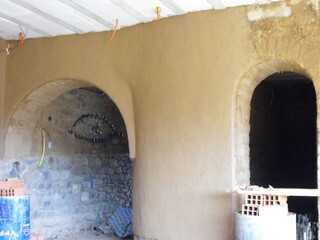 What had been for so long an unfinished adobe brick and stone space, began to look more like a room in a home. The contours of the archways took on form as did the rounded curves of the walls. 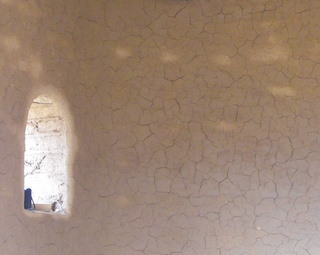 When cracks started appearing in the drying render we were alarmed, but were assured that it was normal. 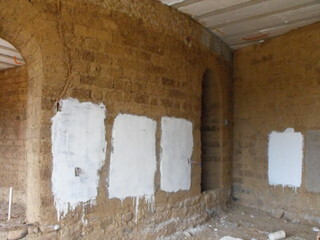 The problem was that, normally, the walls would be finished in gesso (plaster) and the cracks would be filled. We were going to put another skim coat of fine earth render on top and this needed a firm base. . The whole lot had to be chipped off. We had to find a way to work out together how to render the walls so that they would not crack and would stand the test of time. We found some fine clay near the river bed below our property, and after bringing it up to the land, we conducted some tests using different mixes and seeing how they looked with a coat of lime wash.
We used the best result on the inside of the dome. Ed waited anxiously for it to dry, hoping for no cracks this time. It was perfect, and the inside of the dome ceiling looked fantastic. Once the dome was completed it was time to start filling in the gaps between the gate posts and the dome, between the dome and the yet-to-be-built archway that would form the main entrance to our house and then on to join up with the boundary wall. In this way we would create a walled space inside our vast parcel of land. 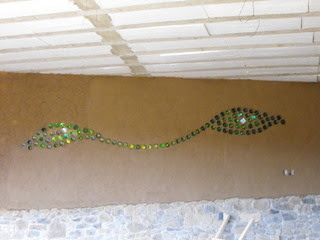 The narrower wall enabled us to use just one row of adobe bricks. 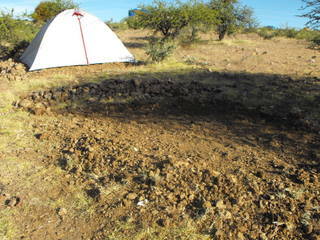 At the same time, we had to start the task of continuing the boundary walls around the property. following another team ahead of them who were digging and building the foundations. It was going to be a long haul to wall in our property. In our posting on 19th November 2009 we showed the start of what was to be a guardhouse, incorporated into our garden wall. As work progressed, we felt less happy about it's given role, and more enthusiastic about using it as a space to get out of the sun; to reflect on the day; to listen to music or even as a simple sleeping space. Ed realized early on in the build that he needed to do some creative projects to provide release from the challenges of managing a Bolivian construction team using Spanish and sometimes Quetchua to communicate our ideas. The dome was a perfect project for him. He had a couple of workers make some smaller adobe bricks and, when they ran out, he and I made some ourselves, giving us a hands on experience of the process. 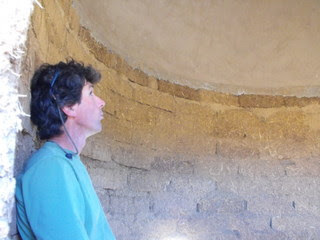 Ed had never built a dome before, but through the internet he found a straightford explanation for shaping the roof. You simply drive a stake into the centre of the floor, cut a length of cord to the required height and tie a toggle to it. That cord enables you to form the dome - you use it sideways to the walls and gradually swing it upways at an angle as the walls move inwards and upwards. This procedure wasn't too complicated to start with but, as the bricks forming the walls started to move in, the scaffolding for ed to work on had to be reduced. Ed devised a system of braces made out of reinforcing steel to hold up the bricks as the mortar dried. 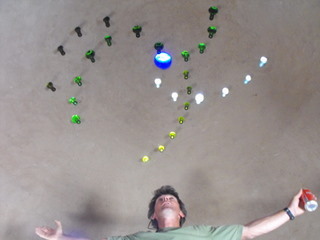 But eventually, there was no more daylight entering the dome roof, except that filtered through the bottles and the blue centrepiece - 3 glass desert bowls placed together to intensify the colour. The dome was left to dry out so that it could be rendered with earth, and fitted out with seating. Ed had created a beautiful building, and was justifiably proud of his achievement. Our boundary walls had to be strong enough to enclose our property for many years to come. 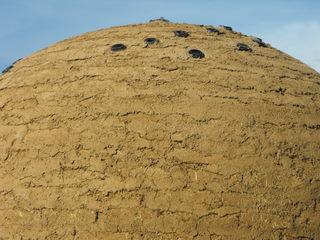 At 70 cm thick (the same as the exterior walls of the house), it would have taken thousands of adobe bricks to encompass our 10.5 acres, so we decided to employ the rammed earth technique. It was suggested by our maestros as a quicker method of building a wall, and would also using the stony waste that had been sifted out of our adobe brick mix. Of course, we had to dig foundations, fill them with stone and cement and then build the stone stem walls to support the adobe walls as we had done with the house. Ed decided to try out the technique to house our electricity meter, but he wanted to investigate the strength of using cement in the mix to perhaps avoid the need to render, possibly lime wash the walls and/or tile them on the top to protect against the rain. He built some wooden forms strong enough to be bolted together on top of the stem walls. Earth was then mixed with cement and poured into the top of the forms where it was rammed down using a metal compactor. This process needed to be repeated three times to reach the required height of 2 metres, and the work was hard and slow. Although the finished result was beautiful, especially as Ed had experimented with different colours of soil, the 3 days it had taken to make this small section of wall convinced us that we should return to the traditional coarser and quicker method. I read about Workaway, an organisation that matched volunteers with people needing help, in the Guardian. Although we were making good progress with building the house, the task of clearing and landscaping our 10+ acres was being neglected. 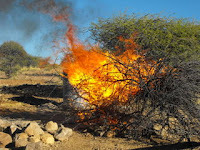 We had previously discounted using volunteers in favour of giving Bolivian workers employment, but we could not physically transport any more men from Sucre out to the land, nor find more local help. 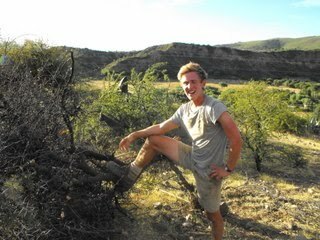 After signing up to Workaway we received a steady stream of enquiries interested in helping us, mostly travelling in South America and wanting a more authentic experience than the usual tours on offer. 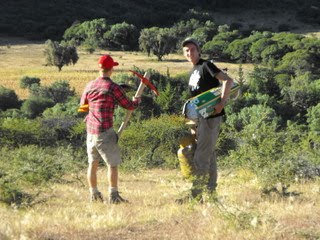 Dominic from Manchester, England, contacted us and hooked up with Thomas from Holland in La Paz on the way to Sucre. 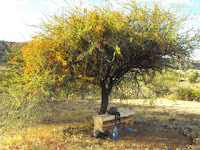 We decided to give them the task of creating a campsite on the land where they could stay, and with subsequent volunteers adding to the amenities. 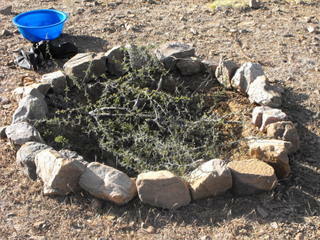 and made a fire pit. 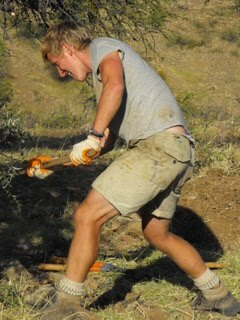 Dominic tackled the removal of a particularly nasty dead thorn bush. 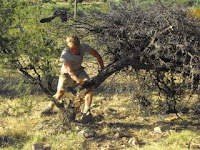 He hacked away at the trunk with an axe, but the wood was so hard it sounded as if it was made of steel. He wrestled with it, but the core was like iron cable. Finally Dom was victorious! 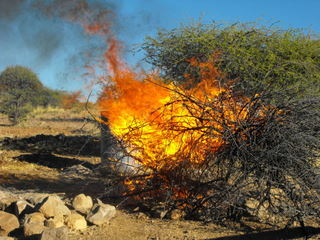 ...so we made a bonfire from the stubborn bush.